I met Shanna Shryne a couple years ago when she was working for Bryce- helping to manage his shop, Curious and gradually securing clients for her interior design business. She was amazing at her job then and now ...well, she's a designer to watch. Shanna just opened a retail shop called Shryne Design in Hermosa Beach, California. I was there in March to see her shop in person and couldn't believe all she has accomplished. There are so many well designed and unique pieces in every square foot of this space- including these painted luggage pieces by Imax. Shanna admits she is always being influenced by trends but keeps the fundamentals of design in her back pocket. As she shared, "I tend to lean towards the organic, minimilistic, quality pieces and design elements." Some of her current favorites come via Jonathan Adler, Alexandra Ferguson, Nest, Globe (Skateboards) and Cat Studio. Shanna, "We specialize in the whimsical, fun side of design. I'm always encouraging the unexpected with a goal of bringing a smile to your face, offering furniture, art, accessories and gifts that can't be found at big-box stores." 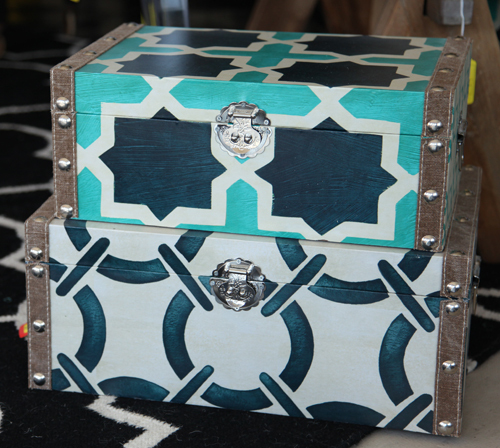 And her price points are great, with a myriad of home items priced well under $100. These metal deer heads are a steal at just $24. There's a little bit of everything in Shanna's shop but it all feels like a cohesive whole. It's like you're in her apartment for the first time and quickly realize you like her taste, then like everything she owns. These incredible chunky bracelets come via Towne & Reese for just $30. She has a kids section too with unique toys and books. And then there are these large monopoly pieces I fell for by Cyan Design. Made with pewter, they are hefty and fun conversation pieces that work well as general decor or even as bookends. Shanna was the first to tell me about Sugarboo Designs, based in Roswell, Georgia. She carries their incredible artwork and pillows throughout the shop. 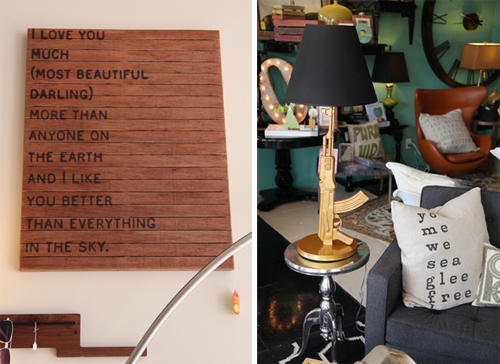 You'll also find the unexpected here- like this machine gun lamp in black and gold. If you happen to visit Hermosa Beach sometime soon, stop by and see Shanna. (and Bryce just down the way) Along with her incredible retail, she offers everything from a free one hour home design consultation to full remodels and new build design work for both residential and commercial clientele. Miss Shanna, a designer to watch... and learn from.